The new technology involves placing multiple NFC chips on a single tag base that are individually triggered when a consumer places their mobile phone on the base and presses a button. “Think of it like an NFC keyboard,” says founder Joanna Rogerson. SUPER TAG: Gema Touch’s Gema Tag holds five NFC chips, a single antenna and a pressure-sensitive keyboard. Click to enlarge. US-based startup Gema Touch has introduced a new NFC tag concept that makes it possible to produce a range of new types of interactive experience. Gema Touch’s technology involves placing multiple NFC chips on a single tag base that are then individually triggered when a consumer places their mobile phone on the base and presses a button. “Think of it like an NFC keyboard,” says founder and CEO Joanna Rogerson. “Having multiple ICs that are triggered by a user tremendously increases the control and functionality capabilities possible from a single surface. Currently, Gema Touch is working with a five chip design but, Rogerson says, “we can increase or decrease that button or IC count no problem”. “We formed the company less than a year ago in an attempt to solve the problem of brands’ inability to connect with mobile consumers specifically at the point of purchase and/or service,” Rogerson explains. “When we thought of our own experiences with branded marketing material in the real world (for example in-store displays, packaging and magazines), we felt we were being flooded with content that was becoming less personal to our everyday actions and, frankly, less fun. Yet our every click online helped to tailor content and experiences that best interested us. “We created our Gema Tag technology to help those brands create more robust, personal, and engaging experiences and to help mobile consumer connect to a digital ecosystem of mobile apps, websites and brand-customized content. 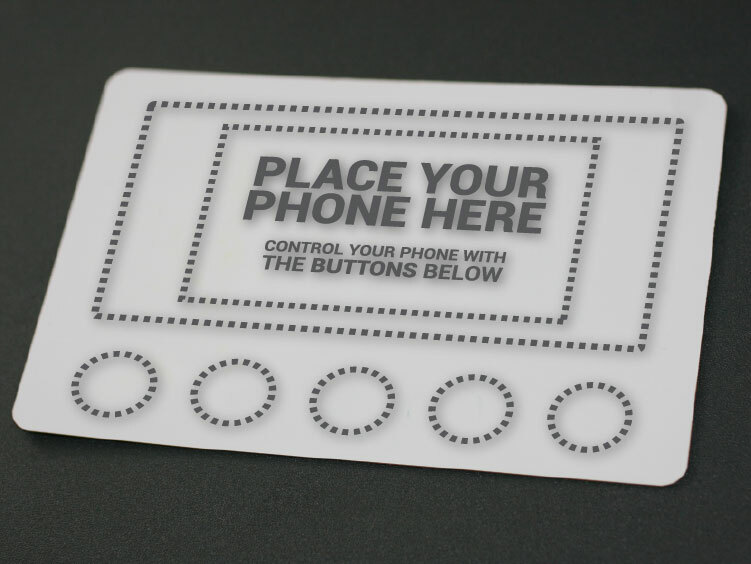 By embedding our tags into printable surfaces, we essentially create a touch interface on items that surround us everyday. “We have been investing a lot of resourcing early on into creating a robust IP platform around the technology,” Rogerson added. Gema Touch’s design has been patented internationally, including design, utility and manufacturing, and an initial short run of fifty tags is now available on a limited edition basis from NFC specialist Flomio. “Everything else will just be sold through us directly,” says Rogerson. Wow, I must really be missing something with these kind of initiatives? Five tags at what price? Compared to one tag that resolves to a mobile experience where the “buttons” are inherent to the site or app? I mean, “game buttons” should be on screen, right? Aren’t we supposed to be tapping our phones, not real world buttons? Minimally, wouldn’t it be about 5x less expensive? Having to “place my phone down” (and let go of it)? Seems like a dodgy UX at it’s most fundamental level. Like I said, I’m just not understanding many of these gimmicky NFC products that seem to be rolling out to market long before there’s a market to roll out to? Sam, I think you’re missing the point and perhaps many others reader as well. The Gema Super tags offer an experience that’s much better than onscreen controls. Especially when you’re talking about mobile phone form factors and the human affinity for printed surfaces. Companies like QuadGraphics (http://www.qg.com), Groupo (http://groupo.com), and Kyp (http://kyp.com) face the challenge of delivering engaging mediums that drive interactivity in consumer space that is more distracted than ever. 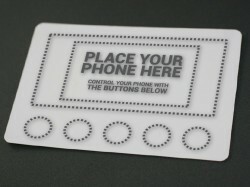 The subtle cues of a printed ad or promotional mailer have shown much higher conversion rates with GemaTouch technology. To be fair, I won’t deny this appears gimmicky. I wasn’t sold on the idea myself until I had one in hand. The responsiveness is amazing, and you instantly get all kinds of ideas on how you can use it… place mats, birthday cards, phone cases, car phone mounts, on product user guides, etc. I mean my mom always complains about having to take out her reading glasses every time she needs to “do something fancy” with her phone. With GemaTouch Super tags, marketers have more real estate to use bigger fonts and more appealing artwork to drive sales within this demographic. You can buy the Gema Super tags on the Flomio store here: http://goo.gl/1OrHO. It’s a limited edition prototype run so the price is set at $25/ea. Now creatives and tinkerers can start playing with concepts that can serve a market growing at 4900% year-over-year (http://goo.gl/wD1wP). That’s a small price to pay to address such potential. Sam, thanks for the comments. I can certainly appreciate a mind at work, but it seems you are suggesting that the only value an end user should garner from NFC is ease of use and quick transactions – touch-and-go activities and quicker financial transfers are indeed likely to be at the forefront of the continued NFC movement. However, I would offer that instead of thinking of ‘why would I put my phone down (which you don’t have to do, by the way) and touch a button that isn’t on my phone’, think of the types of engagement capabilities these user activated tags provide and for whom that really matters. Like Grundy mentioned, brands and their marketing partners spend billions annually in an attempt to better engage mobile consumers. That engagement is measured in a lot of ways and tracked to the nth degree. For brevity sake, one such metric is time spent looking at or interacting with a brand’s product; be it a product’s package, a poster or a magazine ad. Couple that with physical touch and you have a remarkably powerful tool. Multi-sensory branding (http://tinyurl.com/awkhyj8) is based on the idea that we are more likely to “form, retain and revisit” memory when more senses are employed. You can see why one brand would invest quite heavily in the idea that you, a mobile consumer, might remember their brand just slightly more after you finish with that Glam mag. Of course, you are right, in that there will be plenty of occasions where a Gema Tag is not the correct tool. We do not want to be everything to everyone. The example above is just one where we have significant data points to prove the value it brings. I’m a big believer in open innovation as a way of corporate operations. Our model is actually not tag sells, but as Grundy also pointed out, there will be NFC innovators and hackers who think of many more amazing things to do with these than we ever could alone. If we can offer a limited edition, beta release by partnering with other great companies like Flomio to enable additional drive (and attention being paid) to the industry then I think we would all agree that it’s nothing but a good thing.